There are so many things that I can remember about our father, but the one that I guess most comes to mind are the times he would remember when he was on the USS West Virginia. Daddy was a proud man and when he spoke of these times, tears would come into he eyes. He was born from poverty, working in rice fields just to make ends meet, but somehow he knew what his destiny was and he joined the US Navy. There “dad” would become, in his own eyes a better person, one with honor and pride, one who was not “called upon”, but “volunteered”. Those were to men who “wanted” to serve, to “be there” to defend our lady – the United States of America. In these passages you will be brought back to the days of War and feel what my father felt through each day of his life while on the USS West Virginia. His writing are sometimes off in dates, but imagine yourself in my dad’s place – trying to man a gun, listing to men shouting orders, just to keep your ship, your “home on the sea” from being hit! So it is with understanding and visuals in his writings that we must understand, how and why he wrote. February 20, 1943 – dad walked into the Navy recruiting office. February 20, 1995 – dad was laid to rest. January 23, 1948 – dad was issued his release papers from the Bureau of Navel Personnel. January 23, 1961 – his daughter, Barbara was born, as well as 9 years earlier, his son Ray Jr. (Who died at an early age). April 14, 1992 – the first, after almost 20 years, a second grandson is born – Cody Jackson Cope. It’s amazing how these dates correlate in my father’s life. I used to not understand why my father would cry on my birthday or why he was close to Cody. I used to think that perhaps he was trying to make up for the past, to be a better father to me. This may have been what he was trying to do, but now that I have seen my sister Gloria’s transcriptions of his diaries, I realize that there are certain dates that had a significant meaning to my father - memories that were burnt in his mind forever. One cannot explain what war feels like unless you are there. In dads diaries you will be “there” as you read. This is where my dad gets his nickname “Skipper” as he used to say: “You know how they say, “Aye, Aye Captain?” well they used to tell me, “Aye, Aye – Skipper!” Men trusted my dad - he may not have been given the rake of an Officer, but to those men he was. “Skipper” was your best friend, your confidant, the one who may die by your side tomorrow. Of course there were good and bad times, but all in all I think dad would say, “My life was good”. Dad developed cancer about two years before he passed away – the cancer had beaten his body and soul – it’s such an ugly disease – one that wears the body down, but he fought hard – he fought proud and when the battle was over – he went with grace. His last words to me were: “bueno bye” – “fine goodbye” – “I’m gone, but not forgotten – do not grieve for me – just let it be known that I was here.” He was at “home” when he passed on and he left us with memories that will forever be burnt in our minds – thus the name of this book, “Remembering” – the man that was the root of our family. I write this to you dad – may your spirit always wave in each of us! 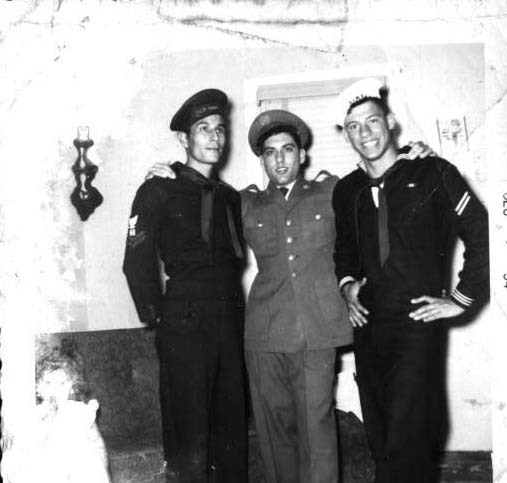 Refugio Martinez is the sailor on the left.